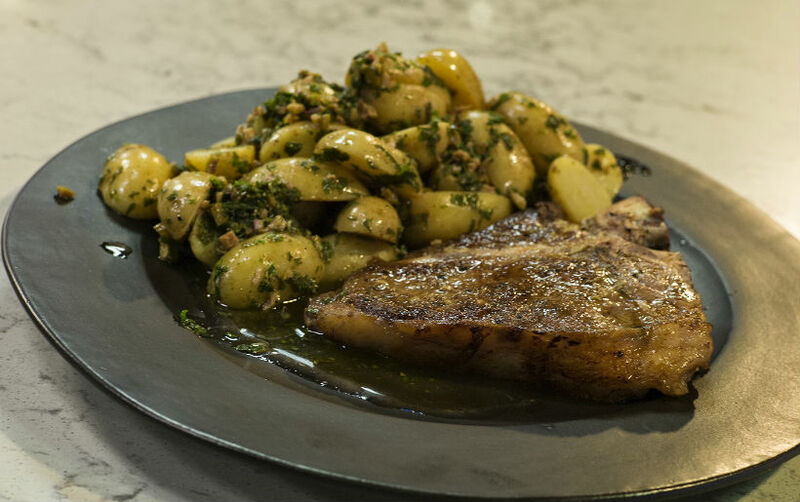 Serve the salsa verde tossed through cooked Mediterranean potatoes. Heat a heavy based pan over a medium-high heat. Coat the steak with seasoning and the extra virgin olive oil. Add the steak to the pan and begin searing, cook the steak for 4 minutes without turning or moving it. Once the steak has a perfectly dark brown crust turn the steak over and start cookingthe other side. Add the rosemary, garlic and butter and begin basting the steak in the butter. After 3 minutes remove the steak from the pan and cover in foil to rest for 3 minutes with the rosemary and garlic.